Dog Cataracts: What All Cocker Owners Should Know! Want reliable information about dog cataracts? You'll find just what you need here: what causes them, symptoms, diagnosis, and the best treatment options for your precious cocker spaniel's eyesight. Cataracts are probably one of the most common eye problems in dogs. It's where the lens (which is what focuses the eye) begins to appear cloudy, eventually affecting your dog's sight. How quickly a cataract grows, and its size, will determine how badly your Cocker's sight is affected. As the cataract covers more of the eye and becomes more dense, it begins to affect your pet's vision by stopping the light getting through the iris and reaching the retina...this is what steals your dog's eyesight! Dog cataracts can form in just one eye (for example, as a result of an injury) or in both eyes at the same time and they may develop slowly or quickly, depending on what's causing them. What Are The Symptoms of Dog Cataracts? The most obvious symptom is the cloudiness or change in color of one or both eyes to a blueish-grey or cloudy white. begin to miss treats when you throw them, sniffing them out instead. no longer recognize family members until he hears them call his name. The above are all indications of a problem with deteriorating eyesight. There may be signs of inflammation or infection, lots of tears or a discharge, and he may squint or blink more than usual. He may also paw at his eyes to try to clear them, or because they're sore and irritated. If the cataract is small there may be no visible symptoms at all and your dog will still be able to see perfectly well. However, as the condition progresses, your pet's sight will become blurred and when the lens is completely covered, it's likely that his vision will be lost. 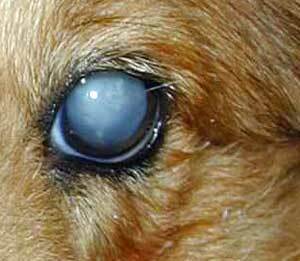 Real problems begin when dog cataracts mature and then begin to shrivel and dehydrate. Once they reach this stage they're said to be hyper-mature and although the shriveling process may improve or even restore his vision, it can actually do more damage than a mature cataract. Being under-nourished can also cause cataracts (particularly where the under-nourishment occurred during the puppy days), but may sometimes be cleared by improving the diet. Important Note: If dog cataracts are caused by an illness, for example diabetes, you're likely to see other symptoms which are not directly related to cataracts, such as increased thirst, peeing more than normal, or weight loss. Could It Be Nuclear Sclerosis? Cataracts are sometimes mistaken for a condition called nuclear sclerosis, which is something that often affects our Cockers later on in life. It's where the lens becomes very hard and milky-looking, just like a cataract, but it's simply part of the normal aging process. Fortunately, nuclear sclerosis doesn't affect your dog's vision and doesn't need to be treated, but I still recommend you take your pet to his vet and allow him to make any diagnosis. How Are Dog Cataracts Diagnosed? Your vet will examine your Cocker's health history for clues as to what may be causing his cataracts. If you're familiar with the history of your dog's parents, jot it down and take it to the vets with you. You can also help your vet by listing out any problems your Cocker's had with his eyes (if any), including injury and recent visible symptoms you may have noticed. When you take your dog into the surgery, the vet will check his eyes carefully for signs of damage, but will also check for focusing problems and/or loss of vision. Your vet may want to test the pressure in the eye and whilst this doesn't diagnose dog cataracts, it could diagnose (or rule out) glaucoma as being the cause. He'll probably measure levels of moisture within the eye and run a couple of simple blood tests to help rule out other dog eye diseases and serious health problems such as diabetes. If your vet is in any doubt, wants a second opinion, or feels it's a serious problem, he'll most likely refer you to an animal ophthalmologist who will have specialist skills in diagnosing and treating ocular diseases and other dog eye problems. A veterinary ophthalmologist may want to check the health of the retina, using ultrasound or electroretinography, to understand just how serious the problem is and whether surgery is necessary. How Are Dog Cataracts Treated? Because there isn't any effective medical treatment for dog cataracts, treatment almost always involves surgery. One such treatment is phacoemulsification, which involves the use of ultrasonics to emulsify the lens. Once removed, an acrylic replacement can be slipped into the empty space left by the old lens. Cataract surgery usually takes about one hour for each eye and has a fairly high success rate. Your dog will be monitored for a few hours until your vet is happy that it's safe for you to collect him and take him home. You'll probably be asked to bring your Cocker back the next day so that the vet can check that there aren't any complications. Recovery is usually between a few days and several weeks and vision is often returned to full capacity. After surgery, your dog will have to wear an Elizabethan collar for a while (nicknamed 'the dreaded lampshade' in our household!) to stop him from accidentally damaging his eyes. In the past, when Max has had to wear a collar, we've been tempted to remove it overnight, but in this case, I really wouldn't recommend it. All that good work could so easily be undone with just one accidental knock or scratch - it's just not worth taking the risk. Your Spaniel will need to be kept calm and rested and that usually means restricted exercise and no contact with boisterous dogs (or children for that matter!) unless they're gentle and very quiet. He'll need eye drops two or three times a day for several weeks, depending on what your vet prescribes, as well as follow-up visits to the surgery to allow the vet to check that the eye(s) are healing. Follow-up appointments are usually scheduled for the first, second, fourth and sixth week after surgery. Can Dog Cataracts Be Prevented? No, you can't stop cataracts from developing, but there are some 'common sense' things you can do to help protect your pet's vision. 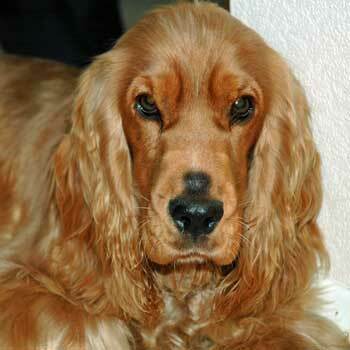 You must look into your Spaniel's beautiful eyes many times each day, I know I do, but do you really look at them? Next time you do, examine them carefully to see if there's anything unusual, such as excessive tearing, bloodshot eyes, or more than the usual gunk in the corners - it only takes a minute! Keeping your dog's eyes clean can really help to keep bacteria, infection and inflammation at bay. Follow the link if you'd like some top tips on how to clean your dog's eyes. It's essential that you take your boy to see his vet regularly and that eye examinations are included in his health check. Your vet will be able to spot any sign of eye problems in your dog well before you do. It goes without saying that a good healthy diet will go a long way to keeping your Cocker's eyes clear and shining, so whether you feed your dog on human food, kibble or wet dog food, make sure you buy the best you can afford. So, if your dog has cataracts it doesn't have to mean the end of your world or his sight. Surgery isn't always necessary, especially if the cataracts are small, because your dog can easily live with them, however, you should always seek your vet's advice. The sooner dog cataracts are successfully diagnosed, the sooner surgery can be performed and there seems to be a high success rate where surgery is carried out early. If you'd like to learn more about cataracts in dogs, follow this link. All the more reason to be extra vigilant with your dog's eyes and if you see any unusual symptoms that make you feel uneasy, make that appointment! And the good news is, once removed, dog cataracts don't return!